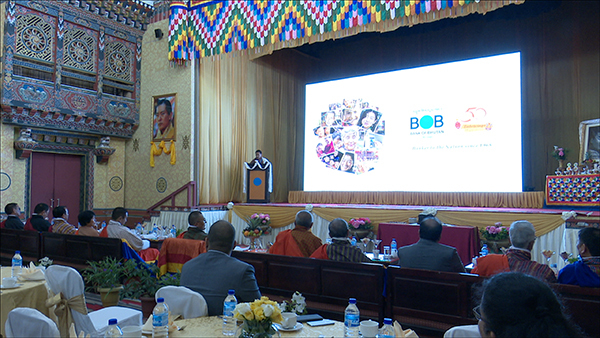 As Bank of Bhutan (BoB) completes 50 years of its glorious existence, the bank celebrated its golden jubilee today. The bank has come a long way since it first opened its doors five decades ago. On this particular day 50 years ago, His majesty the third Druk Gyalpo Jigme Dorji Wangchuck opened the doors of the bank ushering in the era of financial services in the country. His Majesty was the first person to open an account with the bank. Today, the bank is providing its services to more than 250,000 clients. Apart from branch offices in the districts, its services are widespread in the community level as well. Today, with a total network of 48 branches spread all over the country, the bank stands as the largest commercial bank. “One of the biggest achievements of the bank is being able to provide financial services to the nation and the people where it is needed especially during the years when development has just started and financial services were limited,” stated the CEO, Pema N. Nadik. The bank today has more than 700 employees. Established in 1968, it is the oldest bank in Bhutan.